samuji - dress, jacket, shoes. After hemming and hawing for some time about that black dress from Samuji, I decided to go for it. I sold a lot of things that I wasn't wearing anymore and exchanged it for one piece I knew I would wear all the time. It was worth it and I wear this dress at least twice a week. I couldn't tell you enough good things about it - the fabric is a really soft wool (not itchy at all) and lined in a cotton/silk. It has a very sturdy construction and I can tell it's going to last forever. The shoes followed shortly after (size up in these, they run small!) and then I recently picked up an alpaca jacket when they started their sale. I think it's safe to say that after this I'm hooked and not many other lines can compare in terms of fabric quality and construction. They seem to be a more sophisticated and higher-quality A.P.C. The shop staff are also very nice and friendly! I mainly mention all of this because I've had a lot of "misses" this year and it seems harder and harder to find a consistently well made line, and I know I've read on a few blogs that other people have been running into some of the same issues - problem with fit and quality. This dress is sadly not on their site anymore, but they still have the jacket left in a few sizes. 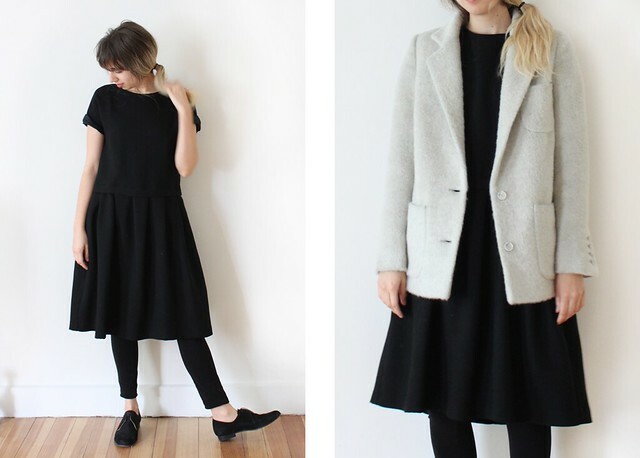 I've only seen two retailers that carry them in the US - one shop in LA called the Foundry and I ran into a few things by chance at Jumelle in Brooklyn (they had the black dress when I was there around X-mas). So if it seems like it might be your cup of tea, I'd say give them a go!